One thing I firmly believe in is to give back to the racing community. For the 8 races I competed in this year, hundreds, if not thousands of people took time out of my day to make my race experience better. Many of these people woke up earlier than I did to compete and worked all day. As I raced, I made sure to thank as many of these people as I could for volunteering their time, but that is not enough. I think everyone who takes part in an organized race, should give back to the community by volunteering at a race. That being said, Amy and I will be volunteering tomorrow morning at the ING-NYC Marathon. You may be wondering what made us choose to do the NYC Marathon, and the answer is simple. Amy and I both follow a number of athletes and athletic companies on twitter. 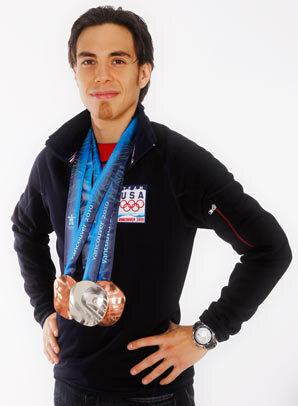 One day reading through the timeline of tweets, Amy saw that Olympic speed skater Apolo Ohno was running this year’s marathon. Amy, like many other American women, has an infatuation with Mr. Ohno, and immediately suggested we volunteer at the race in hopes of seeing Apolo. We have since learned that former Olmpic softball player, Jennie Finch, is also running this year’s race; so I have something to look forward to as well! We looked through the list of volunteer opportunities, and were shocked by the amount of different areas volunteers were needed. We could have volunteered at the race expo, at the start line, at the finish line, as a translator (we don’t quality for this speaking only english), as a bandit catcher, at the aid/water stations, and many more. Amy and I chose to volunteer at one of the aid/water stations, and were then given even more options to choose from. Did we want to be at mile three, four, five, etc. We both agreed that we wanted to be somewhere after mile 13 because we have both run and finished half marathons and we wanted to see what happened after the runners crossed the 13.1 barrier. 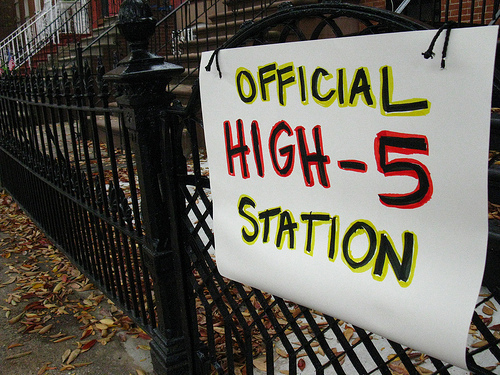 We finally decided on Mile 25 which is a station just outside of Central Park where the race finishes. After seeing us, the athletes will have only 1.2 miles left to the finish! 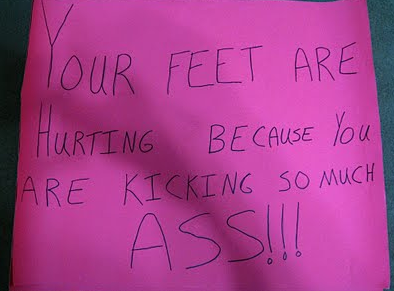 Spectator signs are awesome during a race! 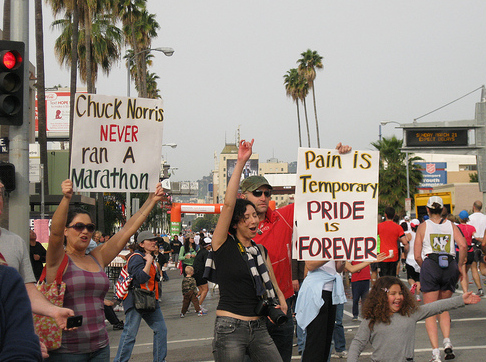 They give runners something to laugh at and seem to make everyone happy. 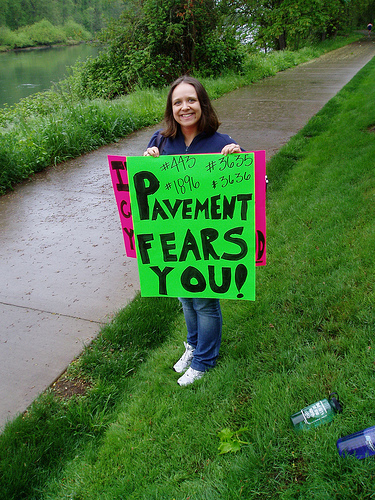 So, my final thought of this post is…if you are going to a race, make a sign! Make two signs even! Make one for the person you are specifically going for, and then one for everyone else. Put some thought into it. 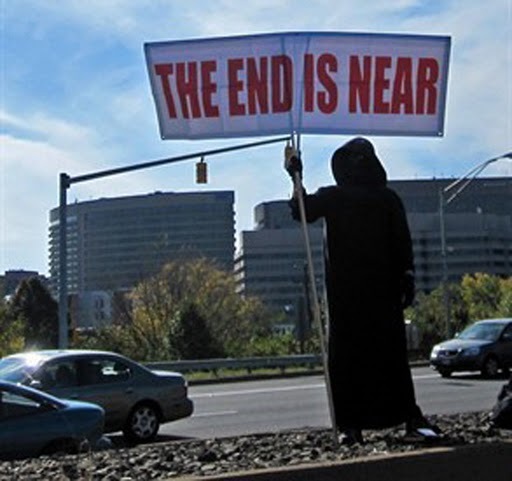 Remember: The wittier the sign, the better and the more laughs it will get! Good luck to all of the athletes competing in tomorrow’s ING-NYC Marathon! Maybe someday I will be out there with you!